Study abroad students Carlos Jiminez, Jennifer Whitt, Amber Peneloza and Celia Welch on the Webster Athens rooftop. 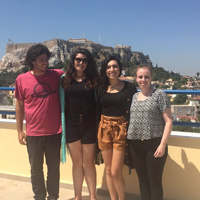 The end of the spring semester came too quickly for students in the Odyssey in Athens study abroad program at Webster University's Athens campus. It was an experience filled with cultural and educational activities, including multiple excursions around Greece, which allowed the students to immerse themselves in the culture and history. The students had the opportunity to learn first-hand about ancient Olympia, Delphi, Mycenae, Epidaurus and the monasteries of Meteora, in addition to the first capital city of Greece, Nafplio. Before the excursions, the students had lectures about the sites in the Greek Art and Archaeology course and were given guided tours on location. In addition to the excursions around Greece, the students had several field trips to the museums and archaeological sites in Athens. Thanks to Webster's convenient location, the majority of these visits were within a 10-minute walk from the Webster Athens facilities. They also made for a memorable life outside of school. "Coming to the Odyssey in Athens program through Webster University has been one of the most influential experiences of my life," said Juan Carlos Jimenez, a senior physics and music major from Goucher College. "Being located in close walking distance of the Acropolis really puts me in the center of life here in Athens, and it allowed me to have a very independent experience because I could access anything I needed. "The program itself is full of excursions which really gave me a strong grasp on what Greece is like outside of the city as well." In addition to the historic sites, students also had the chance to participate in several cultural activities - from learning traditional Greek dances to learning how to prepare favorite Greek dishes during the Odyssey activity hours. These activities helped them feel more connected with the Greek culture and gave them a chance to socialize with their professors and other students. "I have been able to learn so many things about the Greek culture through activities such as traditional dance classes and cooking classes," said Jennifer Whitt, a junior International Relations student from Webster's home campus in St. Louis. "I have also been able to visit some of the most beautiful and historic Greek villages such as Olympia, Delphi and Nafplio with the school. for refugees near the port of Piraeus. Abundant and meaningful experiences are part of Webster's promise to students, and service learning was also a major part of the experience. The students were involved with several community service projects throughout the semester. They assisted in caring for injured sea turtles at the Archelon Sea Turtle Rescue Center and participated in various projects for the refugees in Greece. Another projects involved making sandwiches for refugee men, women and children who set up camp around the port of Piraeus. They collected money with faculty and staff for the ingredients to make over 300 sandwiches which were then delivered to the refugees. Students also helped at the refugee camp Eleonas, which houses approximately 1,000 refugees and is in constant need of supplies such as diapers, baby food, canned milk, sanitary items and medicine. Faculty and staff were left impressed by the students. “Overall it was a very productive semester. The students were amazing and eager to learn about the Greek culture and society," said Dina Skias, director of Student Affairs and the Odyssey in Athens Study Abroad Program. "They learned first- hand about current issues and were enthusiastic to get involved with opportunities that were presented to them. They also met many interesting people along the way. This time in Greece will always remain with them, as Greece has become their second home. We wish them well on their future endeavors and encourage them to stay in touch with their Webster Athens family." 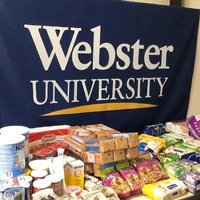 To view more photos taken from the various projects and events, visit the Webster University Athens Campus Facebook page.